It’s officially SPRING CLEANING SEASON and Toni from A Bowl Full of Lemons and I are kicking off our ‘Spring Clean in 30’ Challenge TODAY on Instagram! We are completing 30 cleaning tasks (each under 30 minutes) for the next 30 days and sharing daily on Instagram. If you don’t have an Instagram account, you can find out what we’ve been cleaning each week – here on the blog. If you have an Instagram account, follow us at @cleanmama and @abowlfulloflemons to see our daily tasks. 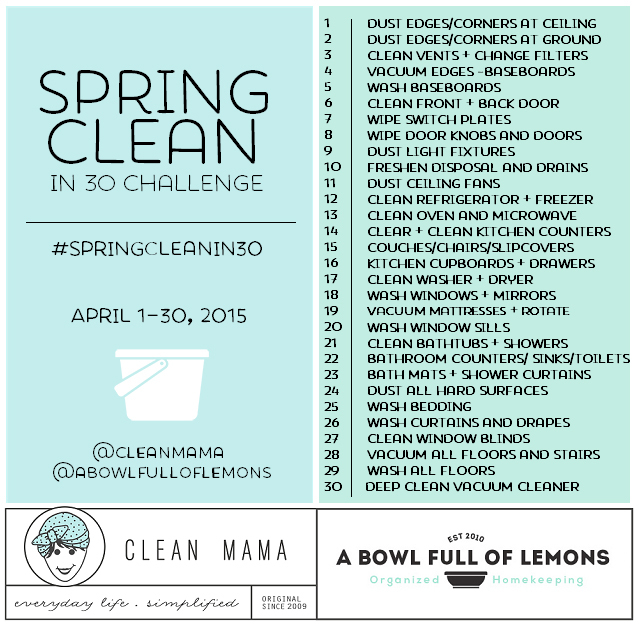 We would love for you to join the challenge and share and tag us, using the hash tag #springcleanin30. I will also post an overview of my week each Wednesday (4/8, 4/15, 4/22 and on Thursday, 4/30). Grab the FREE checklist here! And go here to see all the tools I’ll be using this month as well. I’ll see you on Instagram or back here next week with a review of the first week. Happy spring cleaning! Go here to see all the posts in this series.